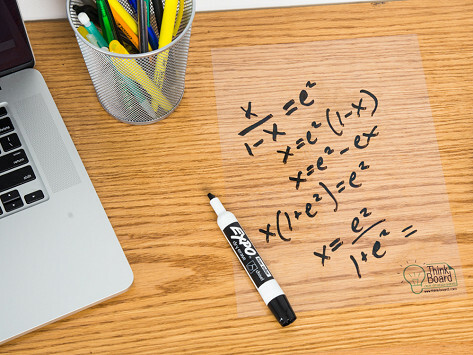 Think Board is a reusable dry erase sheet that can quickly and easily adhere to almost any flat surface. Place it on walls, doors, desks, the fridge—anywhere you want to leave a message or get creative with ideas. When you’re done, remove it and reuse in another location. Dimensions (in packaging): 12" x 3" x 3"
Used daily without problems. Would buy again without hesitation....actually, I did! Mounts on the wall in seconds. I use it every day in the office. My Daughter has this on the wall by the desk and it's always being used for notes, homework, messages for family members or something. It has a thousand and one uses. Got this for the wife who is always jotting things down on sticky notes and losing them. In order to think big, sometimes you need to write big. Think Board lets you do just that. 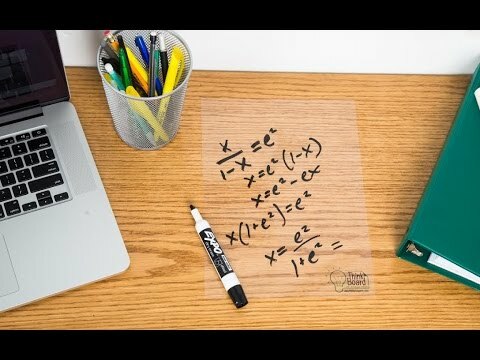 This clear, reusable dry erase sheet adheres to almost any surface to create a “white board” for dry erase markers. Whether it’s a door, wall, fridge, or desk, you can write, erase, and write again whenever inspiration strikes. Even better, it leaves no residue when it’s removed. Founder Hanson Grant came up with the idea and successfully launched a Kickstarter campaign to put Think Board into production. As impressive as that is, consider that Grant is a student at Babson College and that Think Board is Made in the USA. That’s American ingenuity and entrepreneurialism at its finest, and it means that Think Board is dorm room tested and approved. Think Board comes in multiple sizes to fit spaces big and small, and makes a great gift for students, artists, and even teachers (it seems they can never get enough white board space). Lay down one of these surfaces, and watch ideas and creativity spring to life.